THE PATH TO A "GREATER BRITAIN"? After the war, Mary Richardson, the hero/villain of the Rokeby Venus attack, adopted a son and settled in Cambridgeshire to raise ducks with a friend, and to pursue her literary career. It is difficult to imagine a more striking contrast with her earlier life of high excitement. Evidently, however, she still hankered for a public platform. She stood for Parliament a number of times, though with little success , and it must have seemed that her action days might be behind her. She was, however moving rapidly to the Right. In 1933, after previously flirting with the New Party in 1932, she joined the charismatic Oswald Mosley's recently- formed British Union of Fascists (BUF). She quickly rose up through the BUF’s ranks. By 1934, she was Chief Organiser of the Women’s Section of the party, a highly prestigious and responsible position that had originally been held by Mosley's wife Cynthia. She opened a national Club for Fascist Women in London, spoke at BUF branch meetings, was a fiery chief speaker at outdoor and street corner meetings, wrote regularly for the Fascist press, and even organised the quaintly-named Blackshirt Cabaret Ball. She said that she saw Fascism as the “only path to a 'Greater Britain'” and that she felt “certain that women will play a large part in establishing Fascism in this country” . However, despite these high initial hopes, she ultimately left the BUF in 1935/6 for reasons that are disputed, but seem to have involved her having organised a meeting protesting against the unequal remuneration of women employed by the movement . You may wonder why a person such as Richardson, who had dedicated and sacrificed herself to the cause of gaining the vote, would have joined an organisation which favoured an undemocratic, totalitarian government with ultimate power vested in a supreme leader. However, Richardson herself claimed that there was a logical continuity with her militant suffragette activities: “I was first attracted to the Blackshirts because I saw in them the courage, the action, the loyalty, the gift of service and the ability to serve which I had known in the suffragette movement. When I later discovered that Blackshirts were attacked for no visible cause or reason I admired them the more when they hit back and hit back hard” . For Richardson, it was similar to the overwhelming almost-religious conversion she had experienced years earlier when she heard Mrs Pankhurst speak. She later recalled that at her first meeting with the BUF leader Mosley, “I cannot remember a single word of what was said on that momentous occasion. But the words did not matter. In some strange way I was inspired by the atmosphere of that great gathering. ‘We will fight’, I kept on repeating to myself”. Of course, the vast majority of ex-suffragettes did not embrace Fascism as Richardson did. Many, such as Sylvia Pankhurst, actively opposed it. But in addition to Richardson there were two other notable ex-suffragettes that later went on to prominent positions in the Fascist movement. They were Norah Elam  and Mary Sophia Allen . The careers of both of these women are instructive in considering the motives, or claimed motives, of the various types of person that Fascism attracted. Norah Elam had been very prominent in the suffragette campaign. Although accounts differ, she had probably joined the WSPU in 1912 , at the height of the increased militancy. After being heavily involved at local level, including involvement in street brawls, she rose to be General Secretary of the WSPU and became closely associated with the Pankhursts, making speeches and chairing public meetings, and writing articles for The Suffragette, often defending extreme actions carried out by members. She herself was imprisoned three times and was subjected to forcible feeding, against which she campaigned vigorously. During the War she also campaigned enthusiastically with Mrs Pankhurst against trade unions and socialism. Later she stood unsuccessfully for Parliament as an Independent. Her campaign was based on the expulsion of aliens, and even after the War was over, she was advocating that it should be forbidden for anyone with German birth “to enter, land or reside in any part of the British Isles”. Unlike Richardson, she came from a Conservative Party background, which she left to join the BUF in 1934, together with her partner Dudley. Norah was estranged from her own birth family but had high social aspirations, and presented Dudley as having a (largely fictitious) royal ancestry. She also went to “great lengths” to conceal the fact that their relationship was only de facto, and that she had an unwanted illegitimate child . She was an accomplished and effective speaker, with definite and often intimidatingly-expressed views – she was vigorously anti-the League of Nations, anti-vivisection, anti-vaccination, and anti-the medical establishment. Norah was much taken with Mosley, who supposedly had “the thoroughbred social status she fantasised about for [her husband] and with the dynamic political career that she herself desired”. She was quickly admitted to his close circle , with increasingly significant control over BUF finances. She sent her young son to attend school in Germany in 1934, where he joined the Hitler Youth and, reportedly, delighted in “Jew-baiting” exercises . She herself also had aspirations of meeting Hitler, and was a good friend of fellow Fascist ex-suffragette Mary Allan (whom we shall meet again shortly). In her capacity as an “An Old Suffragette”, Norah wrote many articles in Blackshirt and Fascist Quarterly attacking the limitations of women’s freedom under democracy . She felt that her militant suffragette status gave her special moral authority for her view that the freedom that she had helped win was just a bluff. Democracy was antiquated and worn out, and the party system upon which democracy was based enslaved women and men alike. She attacked former militant suffragettes who opposed Fascism as “extinct volcanoes either wandering about in the backwoods of international pacifism and decadence, or prostrating themselves before the various political parties”. They had failed to realise, or refused to see, that Fascism – “the creed of the New Age, the Herald of all our hopes for true liberty and just freedom” – represented the logical continuation of the suffragettes’ heroic struggle . After the Second World War was declared in 1939, Norah continued to liaise closely with other extreme right-wing associations, and in 1940 she was arrested and imprisoned, together with various other prominent Nazi sympathisers. She would prove to be the only one of the three ex-suffragettes to actually be interned. She was released in 1942, presumably on the basis that she represented a low risk to public security. After the BUF was finally disbanded in 1945, Norah became associated with Arnold Leese, an extreme anti-semite who had always considered that the BUF was “soft on Jews”. Norah was later reported as saying, “If Hitler killed so many Jews, why are there still so many alive?”. Mary Sophia Allen, unmarried and in her early thirties, had renounced her upper middle class family and friends and had the by-now familiar semi-religious conversion to the WSPU in 1906, after hearing prominent suffragette Annie Kenney speak. Allen described her participation in the movement as a “sacrifice”, and her identity in the WSPU as “one of the chosen” . Allen had formidable organisational and speaking skills,and by 1909 she was making newspaper headlines as an active suffragette. She was imprisoned three times for various breaches of the peace, including window breaking at the Home Office and Tax Office and was forcibly fed while on hunger strike. Noting that “we were proud of being gaol-birds” , she appreciated the strong feeling of sisterhood she received from her involvement with the WSPU. For Allen, Mrs Pankhurst's closure of the militant campaign on the outbreak of war came as a “bewildering blow”. “I won’t pretend that we like it!” she wrote later. At the time, she said, she was “actively – and shall I admit it, delightedly – planning some further burnings of empty houses, in which we had been so successful of late” . The change of focus left her bereft of adventurous ways of serving her country. Hardly surprisingly, she scorned the offer of a job as organiser for Queen Mary’s Needlework Guild (! ), and along with a number of other suffragette women she joined the first Women Police Service (WPS) – a somewhat ironic choice, given her criminal record and history of resisting police. She became second-in-command to Margaret Dawson – who became her partner – and some years later took over as Commandant after Margaret died . The objectives of the WPS, which was eventually sanctioned by the government. were to help women and children, and to keep them “safe” from men and from themselves. With large numbers of troops about, the WPS were invited to help prevent young women from falling into prostitution, with some powers to enter houses, acting as a type of moral guardians. They were also involved in helping war wounded, regulating security and order issues arising with the large numbers of women working in munitions factories, and in attending to the welfare of released women prisoners. 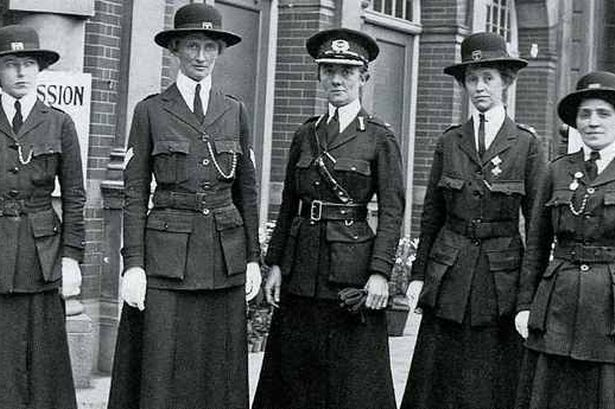 By 1917 there were 560 uniformed women in the force, trained in first aid, self-defence, court procedure and signalling. Both Allen and Dawson were awarded an OBE (Order of the British Empire) for their police work. As most of the members were what Allen described as “women of leisure”, the work was initially voluntary. The uniform, designed by Allen, was substantially identical to that worn by the armed forces. Allen herself was now being described as having the utmost aversion to dresses. In addition to her uniform, she cropped her hair, wore long leather boots, gauntlets and later sometimes even affected a monocle. As the war ended, the government officially defunded the WPS, and replaced it by a new force of women police under the direct control of the Metropolitan Police. The Commissioner's view was that the WPS was controlled by former militant suffragettes, and that he wished to get rid of any “woman of extreme views – the vinegary spinster or blighted middle-aged fanatic” . However, the WPS blithely refused to disband and continued on in an unofficial capacity -- although, after a court order, under the new name of the Womens Auxiliary Service (WAS). Allen continued to ostentatiously wear her uniform in public at all times, despite justifiable charges that she was impersonating a “real” policewoman. Despite her unofficial status, Allen acquired an overseas reputation as a leading women policeman and was frequently invited to assist official police forces in operations as varied as combating venereal disease in Germany, or accompanying police raids and searches of women in Ireland. In a hectic schedule, trading on her assumed official status, she travelled round the world, including the United States, Canada, Europe, South America and even Egypt to give talks to police or womens' organisations, or to attend conferences. Strangely, even in England, she was used by the government to help in strike breaking. Allen's distinctively stern and mannish appearance created bemusement wherever she went, a reaction which she interpreted as intense admiration. Julie Gottlieb says that Allen also had a preference to be addressed as “Sir” when on “official” duties . It is hard not to be impressed by Allen's extraordinary energy and enthusiasm in so many fields. Apart from contesting an election as a Liberal (for the Liberals – she came last), she was a talented, prolific writer (though not entirely reliable), a trained pilot, and a judge at the prestigious Crufts Dog Show. But some of her views were undeniably idiosyncratic. She was, for example, convinced that the sources of crime included “foreign undesirables”, films and nudist camps; and that most criminals were left-handed . Allen did not formally joined the BUF until quite late, probably in 1939, although she had long been associating with ultra-right women. She also had earlier met Hitler, Goering and Franco and expressed her firm belief in the necessity of a dictatorship , which she regarded as being necessary to give direction, discipline and control in an uncertain world. Her admiration for Hitler was intense. In her 1934 book A Woman at the Crossroads she agreed with a recent speaker who proclaimed that the need of the world was for “a Hitler of the Spirit”. In her account of her meeting with Hitler, she recounts that, “for two and a half hours I sat absolutely entranced... listening to the great Dictator … this man's hypnotic gestures, his passionate forceful voice and his visionary eyes held me spellbound”. In her considered view, Hitler was “an enduring friend of England, and a blood-brother of the ordinary decent people of Europe”. As far back as 1934, Allen had become a figure of interest to the Home Office and the internal security organisation MI5. By 1936 she was believed by some in the government to be a secret adherent of the BUF and possibly a spy for Franco. Her internment was seriously considered in 1940, though this was ultimately rejected, being replaced by an order restricting her movements . so What did British Fascism offer? To put these three conversions into context, we need to understand just what Fascism – and British Fascism in particular – meant to people in the early 1930s. At this time, Fascism did not fully have the same pejorative overtones as it commonly does today. The excesses and horrors perpetrated in its name during the Second World War were still in the future. Fascism originated in Italy (see our article here). It can broadly be described as an ideology based on extreme nationalism, militarism, an authoritarian state with undisputed power vested in the (male) leader, a protectionist economic policy, conservative social values, anti-communism, self-sufficiency and opposition to alien races or nations. Today, it is most known for its role in the rise to power of Adolf Hitler in Germany in the years after the Great Depression and in various South American dictatorships later in the century. From a very early stage, Britain had its own brand of Fascism with some singular features, most notably the role played by women. 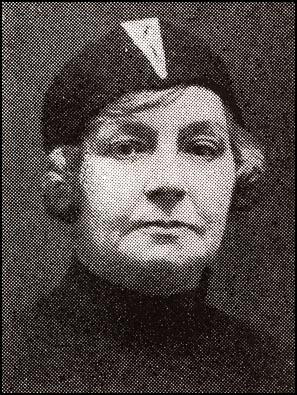 The first Fascist organisation there, the British Fascisti  was actually set up in 1923 by a woman, Rotha Linton-Orman, and was funded by her wealthy mother. This body’s aims, which developed over time, were to deliver Britain from anti-communism, to rid the country of the “alien menace”, to encourage a sense of duty, to protect children from subversive and blasphemous teachings and to oppose the rise of the trade union movement. It enjoyed a relatively high level of participation of women, mainly from the middle and upper middle classes, and its membership – especially its leadership – included numbers of converts from the right wing of the Conservative Party . In the 1930s, the movement became more specifically rascist and anti-semitic (Bolshevism was understood to be a Jewish plot to take over the world) and other ideological splits also emerged, contributing to its decline . 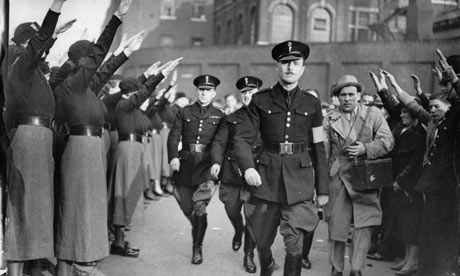 In 1932, Oswald Mosley, a former Conservative MP who had later dallied with Labour and founded the short-lived New Party, created the rival British Union of Fascists (BUF), which attracted many of the Fascisti’s former members. At the time, Britain was still suffering significantly from the effects of the Great Depression. Unemployment was still very high, there were worries about the national budget, social conditions were still challenging in some parts of the country, and the political leadership was uninspiring. Britain’s future role in the world, so prominent at the start of the century, was now uncertain. In these difficult circumstances, it was possible for extreme policies from both the right and the left to gain currency. Both the BUF and the British Communist Party increased in popularity, though from a low base . The BUF's tactics were notable for spectacular, almost-cinematic mass rallies, its often vitriolic propaganda, its distinctive uniforms, an emphasis on physical action and the “virility of struggle”, and a paramilitary wing (the Blackshirts) responsible for aggressively “keeping order” at BUF events. Its popularity took a hit in 1934, with riots that accompanied the mass rally at Olympia Stadium. That incident, which contributed partly to the later government ban on the wearing of political uniforms, also cost the BUF the invaluable support of the previously enthusiastic Daily Mail. The BUF's appeal further declined with the slowly improving British economy, the beginnings of realisation of the threat from Fascist Germany, and the BUF’s increasingly vitriolic anti-semitic policy line [79A]. It did not stand any candidates in the 1935 election and instead campaigned for voter abstention, adopting the hopeful slogan “Fascism Next Time”. Although the BUF participated in the democratic process, its stated aim was that once it achieved power by constitutional means,it would introduce a totalitarian “one party” state. The supreme leader (Mosley) would himself appoint the heads of government business, with an advisory “House of Commons” representing the interests of various social and occupational groups (including mothers). The BUF openly expressed contempt for democracy and the party system, which they portrayed as decadent and diseased . Democracy was held responsible for allowing Jews to operate openly. Even the fact that the few women who had been elected to Parliament tended to be unmarried or childless was considered to be evidence supporting the BUF's jaundiced view. It played on fears resulting from the triumph of the Bolsheviks in the Russian Revolution a generation before. When coupled with post-War uncertainty, this led some people to overcome their objections to the Fascists’ anti-democratic stance; they began to believe that the only choice for the future was to be between communism or Fascism. As the BUF proclaimed, “You have the vote – Yet you are still powerless” . All three suffragettes would also have some special reasons for disillusionment with the democratic process. Despite getting the vote, few women had actually been elected. And all three suffragettes had themselves also suffered multiple and/or convincing defeats in elections. Elam felt that democracy was a sham, and was disgusted that the first elected woman was from Sinn Fein; Richardson considered that the BUF’s combination of action and discipline raised the movement above comparison with the present party system ; and Allen had long made clear her preference for a dictatorship to provide discipline, direction and control in a world full of dangerous forces. Like the old British Fascisti – and unlike the German nazis – Mosley’s BUF allowed and in fact encouraged women members, and displayed its openness to a relatively high level of women candidates, probably more than 20%. These proved to be mainly from the middle and upper classes. For some women, the mere fact of becoming a member could be seen a striking blow for independent thinking . Fascism was promoted as a type of ”nationalist feminism” -- the ideal home for the patriotic but independent and active woman . Through its Womens' Section, with its own newspaper, social events and meetings, the BUF provided a forum in which to express feminist concerns. It recognised women's value in public relations and propaganda. Mosley claimed that, “My movement has been largely built up by the fanaticism of women; they hold ideals with tremendous passion. Without the women I could not have got a quarter of the way” . Mosley particularly welcomed the ex-suffragettes and utilised their conversion as a propaganda initiative to draw more women to the BUF and help it overcome its overly masculine image. The suffragettes' struggle was portrayed by both the BUF, and the women themselves, as the precedent for Fascism. Norah Elam, for example, said that, “Fascism is the logical, if much grander, conception of the momentous issues raised by the militant women of a generation ago” . Significantly, however, Mosley did not mention Richardson's Rokeby Venus exploit as part of this convenient narrative. In general, he also did not insist on strict orthodoxy in the case of particularly valued members . Women’s role, while recognised, was different to men’s. Mosley wanted “men who are men, and women who are women”. Equality was served by giving women political representation in the future Corporate State. Although men were the defenders and leaders, women were crucial in many organisational roles. The growing membership and relatively high proportion of young people meant that there were opportunities to rise in the ranks . Though women’s role was limited, it was at least presented in a positive way – in BUF rhetoric, Fascist mothers were visualised as healthy, intelligent and quick-witted women, with strong characters . In support of this, the BUF promised measures such as pre-birth education, women doctors, obstetric training for doctors, better trained midwives and improvements in maternity wards. Contraception was not to be banned. Outside the home, appropriate professions for women were seen as being in education, town planning, architecture, medicine, obstetrics, midwifery, nursing and social welfare. As it happened, of course, the BUF never had to put much of this into practice, so women did not have much opportunity of judging its sincerity on these issues. As we have seen, Mary Richardson apparently did leave in disillusionment, though she was the only one of the three to do so. Our account of the three ex-suffragette Fascists has already given some hints about what motivated their conversions. Of course, the vast majority of ex-suffragettes did not follow this path, and many vigorously opposed it. Supporting Fascism was certainly an extreme step. But for the small number of former militant suffragettes who were able to overcome any compunctions about totalitarianism, ultra-nationalism, male supremacy and anti-semitism – that very small number – the BUF undeniably provided some attractions. Firstly, there were a number of organisational aspects of the BUF which reflected aspects of the Pankhursts’ WSPU, even if in a distorted way. These included the use of daring and risky militant tactics, the concept of a supreme charismatic leader who tolerated little dissent, the embrace of ultra-patriotism and anti-communism, an implacable opposition to one’s enemies, a surrogate family of like-minded women, a sophisticated and at times vitriolic propaganda program, an emphasis on self-defence skills, a distinctive uniform (complete with medals) and the use of spectacular mass rallies. Secondly, at a more personal level, Mosley’s careful cultivation of the ex-suffragettes allowed them to relive and get credit for past glories, to commit to a glorious cause against the odds, to participate in a structure involving discipline and control, to exercise their formidable organisational and propaganda skills, to demonstrate their independence as women, to exhibit fortitude under attack, to put into effect their considerable physical and emotional courage, and to perform again on the public stage. Thirdly, from a policy point of view, for people who had become thoroughly disillusioned with the political system and the state of Britain in the 1930s, and with what the vote had delivered, the Fascistic embrace of strong leadership through totalitarianism could appear to be an attraction, rather than a stumbling block. As women who felt that they had been poorly treated by the patriarchal system in the past, and felt cheated by democracy, the Fascist policy on women – at least on paper – provided them with a considered and significant role, even if it could not countenance ultimate leadership. And the Fascists’ xenophobic approach, particularly to Jews, could at best be an attraction (at least for Norah Elam and Mary Allan), and at worst a non-issue. It is also interesting that our three ex-suffragettes shared a striking capacity to reinvent themselves. Their conversions – to female suffrage or to Fascism – were sudden, revelatory and intense . They also had a strong tendency to blot out or reinterpret areas of their life that became inconvenient or inconsistent. Mary Richardson, for example, does not discuss her BUF membership at all in her Laugh a Defiance. Norah Elam, who had largely broken with her own family, appeared to construct a semi-fantasy world in which her de facto partner had associations with royalty. Mary Allen barely mentions her siblings by name in her autobiography, and constructed a semi-fictional status as an official serving policewoman. She almost seems to change personas with every change of her beloved uniforms – from the pure suffragette in white, to the mannish police blue, to the Fascist black. She herself appeared to recognise that to some extent her need for activity may have been of more importance to her than the actual cause into which she poured her energies . 49. Her votes in the various elections ranged from 7% to 26%. 50. Martin Durham, Women and Fascism, Routledge, London, 2006, at 46; Fascist Week 22-28 December, 1933. 51. Julie V Gottlieb, Feminine Fascism: Women in Britain’s Fascist Movement, I B Taurus, London, 2000, at 152. Another organiser Mrs Carrington Wood, resigned shortly after Richardson, similarly citing disillusionment with the reality of BUF policy on women. 52. Gottlieb, op cit at 164. It is interesting too that Richardson had first expressed some interest in Italian Fascism, or at least Mussolini, as far back as the 1920s. 53. Gottlieb, op cit at 170. 54. Also known by the name she took on her first marriage, Norah Dacre Fox. 55. All three were almost exact contemporaries, being born during the period 1878 to 1883 and dying within the period 1961 to 1964. 56. McPherson, op cit at 30ff; Pugh,op cit. 57. McPherson,op cit at 106. 58. McPherson, op cit at 113, 120, 124. 59. McPherson, op cit at 165. 60. McPherson, op cit at 200. 61. McPherson, op cit at 197. 62. McPherson, op cit at 178. 63. McPherson, op cit at 179, 186. 64. McPherson, op cit at 223. 65. Nina Boyd, From Suffragette to Fascist; the many lives of Mary Sophia Allen, The History Press, Gloucestershire, 2013, at 45. 66. Boyd, op cit at 30. 67. Boyd, op cit at 46. 68. The following account is based largely on Boyd, op cit at 48ff. 69. Boyd, op cit at 76. 70. Gottlieb, op cit at 152. 71. Boyd, op cit at 115. 72. Boyd, op cit at 114. 73. Boyd, op cit at 125ff. 74. Boyd, op cit at 126. 76. Later, its name was wisely changed to British Fascists. 77. Gottlieb, op cit at 30. 78. It was disbanded in 1935. 79. However, they only won one seat in Parliament between them, this being by the Communists in 1935. 79A.For an article discussing the question of whether Mosley was a passionate anti-semite, or just a reluctant one, see Daniel Tilles "Mosley: antisemite", History Today, February 2015, page 47; and the same author's British Fascist Antisemitism and Jewish Responses, Bloomsbury, 2014. 80. Gottlieb, op cit at 95. 81. Gottlieb, op cit at 170. 82. Gottlieb, op cit at 151. 83. Gottlieb, op cit at 7. 84. Gottlieb, op cit at 43. 85. Interrogation of Mosley following his arrest in 1940; cited in Durham, op cit at 49. 86. Gottlieb, op cit at 164. 87. For example, Allen's lesbianism seemed not to be an issue to her progress in the BUF, despite its generally intolerant attitude to “deviants”. For the issue of lesbianism generally in the WSPU, see the differing views of Pugh and Purvis, op cit, and Purvis's letter at http://www.timeshighereducation.co.uk/features/pughs-book-is-full-of-errors/166782.article. 88. Gottlieb, op cit at 76. 89. Gottlieb, op cit at 98. 90. This general tendency had a loose precedent with Mrs Pankhurst’s sudden change of focus from women’s suffrage to nationalism. 91. Boyd, op cit at 22.